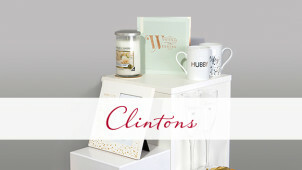 Founded in 1968, Clintons is a pioneer retailer of the greeting cards community. Offering more than quaint cards to make every moment one to celebrate and cherish - at Clintons you can find gifts and gift wrap galore too - to mark every occasion as it deserves. This trusted card retailer will always be at your side, for birthdays, weddings, new baby cards and more. With such a grand selection of categories to choose from, no person, age group, season or milestone moment will be unheard of at Clintons. Perhaps you’d like to send out a classic invite to say thank you or to welcome someone to your new home, or should you want to celebrate a specific religious time of year such as Passover, Chinese New Year or Hanukkah - you will find fine options at Clintons. With frames, photo books and deliciously smelling Yankee Candles available too - you can treat another perfectly here to show them that you care. No matter what moment, let Clintons help you make the most of it. Note that offers without codes will be automatic so you can continue to checkout securely. You can sign up to the Clintons newsletter to receive fun information, inspiration and exclusive offers too, straight to your inbox. Where is my nearest Clintons? Use the store finder online to find a Clintons near you. Is Next Day Delivery available at Clintons? Yes, you will receive your Next Day Delivery order the following working day if placed before 2pm Monday - Friday. How long will overseas orders take to arrive with Clintons? Depending on the destination, delivery can take up to 14 days. Prices vary between items, starting at £0.55 per letter. See here for a full delivery charge breakdown. Please return goods in a saleable condition and with proof of purchase. Call 0208 502 3711 or use the contact form online. When you want to say something meaningful, and to cherish or celebrate a moment - Clintons can help you express your emotions with its great array of beautifully crafted and quality greetings cards. Use a Clintons discount code and save on creating memories with those closest to you. For a birthday, Christening, New Baby or other special occasion as well as for seasonal and festive periods like Christmas and Easter - the cards and more on offer at Clintons will let you enrich each moment. Clintons wants to help you to strengthen your relationships, and with gifts galore on offer too - you can do just that. From Yankee Candle goods to create a happy home ambiance, to clothing and accessories from Disney for children to play dress up in - you can even find the special pieces you need from Clintons to put on a party! For every celebration, find confetti, banners, even games and tableware - now you can bring your special event to life. Who doesn’t love a good birthday? Whether it’s your own, or another’s - it’s always an occasion to truly celebrate and indulge in! Clintons aims to make every birthday brilliant, and with cards and gifts galore on offer - a Clintons voucher code will let you save on an abundant choice of goods to help you celebrate every age, milestone and relationship. From comical numbers, to stylish and art deco designs too, you’ll be sure to find one that’s perfect for the recipient with Clintons.